"Often, during trying times, if we allow ourselves, it is as though we receive a subtle signal in the form of some small wonder... During a time in my life in which I had an important decision to make, I was trying to sort out my thoughts. "As I looked out over the horizon, I noticed that the billowing clouds resembled a figure that seemed to me to point the way that I should choose. And while I know they were only clouds, like an angelic messenger sent to one needing help along the way, they were just as beneficial as all the other small wonders that I've experienced when I needed them most." Matted Size: 11" x 14"
Please add $10 for shipping & handling. Matted Size: 16" x 20"
Please add $12 for shipping & handling. 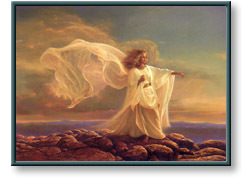 Image Size: 16.25" x 21.25"
The Messenger copyright© 2002 by Greg Olsen is prohibited from being copied. All applicable copyright© laws apply and are reserved by artist Greg Olsen.